Tesla produced 15,510 vehicles during the first quarter of 2016, including 12,851 Model S sedans and 2,659 Model X crossovers, but the company says it expects to deliver 20,000 vehicles during the second quarter as it overcomes quality problems with the Model X.
SAN FRANCISCO -- Customer deposits for the $35,000-and-up Model 3 sedan helped Tesla Motors Inc. grow its cash on hand during the first quarter of 2016, according to an earnings report that Tesla released on Wednesday as it reported a wider net loss of $282 million. Tesla posted $1.1 billion in first-quarter revenue, according to generally accepted accounting principles, up 22 percent from a year earlier. Under its preferred non-GAAP accounting techniques, which do not require Tesla to defer revenue from leases and vehicles sold with a guaranteed resale value, the Palo Alto, Calif., company’s revenue grew 45 percent to $1.6 billion from $1.1 billion in the first quarter of 2015. The $1,000 deposits that Tesla took in the first quarter as reservations for the Model 3, which Tesla has vowed to start delivering in late 2017, are listed as liabilities on the company’s balance sheet. Still, they helped Tesla rebuild its cash on hand to $1.4 billion from $1.2 billion at the end of the previous quarter, which may help to quiet criticism from Wall Street that Tesla has started to run treacherously low on cash. Tesla rebuilt its cash pile by withdrawing $430 million from a credit line during the first quarter, then repaying $350 million in April by using customer deposits, that were still considered receivables -- not cash -- at the end of the first quarter. Some of the $350 million came from Model 3 reservations after Tesla received the cash from deposits placed on credit cards. The rest came from payments for vehicles that were still in transit at the end of the first quarter, Musk and CFO Jason Wheeler wrote in a letter to shareholders on Wednesday. They said the backlog of reservations for the Model 3 has persuaded the company to accelerate by two years its timeline for reaching its production target of 500,000 cars a year -- to 2018 from 2020. 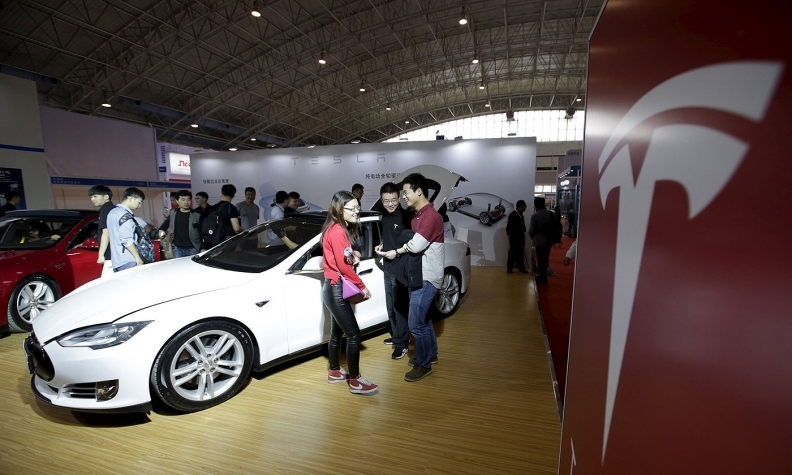 Tesla CEO Elon Musk originally announced the goal in early 2015 at the Automotive News World Congress in Detroit. “Increasing production fivefold over the next two years will be challenging and will likely require some additional capital, but this is our goal and we will be working hard to achieve it,” Musk and Wheeler wrote, adding that the plan may prevent Tesla from becoming cash-flow positive in late 2016, as Tesla indicated in February. Tesla disclosed earlier Wednesday that two senior production executives -- Greg Reichow, vice president of production, and Josh Ensign, vice president of manufacturing -- will leave the company, although Reichow will continue at Tesla until the company can find a replacement. In its letter to shareholders, Tesla reiterated plans to produce between 80,000 to 90,000 new vehicles in 2016. Tesla produced 15,510 vehicles during the first quarter of 2016, including 12,851 Model S sedans and 2,659 Model X crossovers, but the company says it expects to deliver 20,000 vehicles during the second quarter as it overcomes quality problems with the Model X.
Tesla has suffered from manufacturing challenges with the Model X, affecting its mechanical seats, upward-opening falcon wing doors and panoramic windshield. To prevent a recurrence of the problems with the Model 3, components will not win approval unless the manufacturing team says they can be easily built, Musk said. He said Tesla has set a goal for suppliers to be ready for Model 3 production on July 1, 2017, and that he wants to build 100,000 to 200,000 units next year, but he recognizes these stretch goals may be impossible to meet. Musk said Tesla is recruiting heavily to build cars more quickly and reliably.